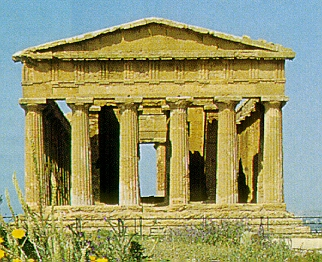 Akragas, modern day Agrigento (to the Romans Agrigentum), according to legend, was founded by Daedalus and grew to become a wealthy and powerful state on the southern coast of Sicily. These colonists from Gela became very prosperous and the city was famous for its lavish lifestyle. Part of the great wealth of Akragas can still be seen today in the famous Valley of the Temples. This is by far one of the most impressive temple complexes of ancient Greece. The Doric style temples date mostly from the 5th century BC and include the temples of Concord, Hephasistos, Zeus, Herakles, Asklepios, Juno and the Sanctuary of the Chthonic Divinities. The Temple of Herakles dates from the late 6th century BC. Additional temples were added during Roman times. Akragas was an important Sicilian city second only to Syracuse. Its first coinage appears during the very late 6th century BC in the form of a bronze cast ingot with a tooth shape. This denomination was a trias. Some have argued that this may have been merely a weight used to measure gold or silver. However, based upon the quantity known to have survived, it would appear that this served as some form of a medium of exchange but could have doubled as a weight standard. Nevertheless, the design employed here, and eagle and a crab, ultimately became the mark of the city’s coinage for nearly 200 years. 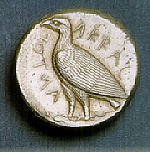 The first silver coinage appears around 510 BC in the denomination of a didrachm utilizing the eagle on the obverse and crab for the reverse. We also see the issue of a silver drachm during this early period of 510-472 BC. While the designs were much advanced for the Archaic period in Greek history, they were later refined in style around 472 BC when the introduction of the tetradrachm first appears. The design began to evolve showing the eagle standing on a Corinthian capital. This most likely coincides with the explosion of temple building in the Valley of Temples during the mid 5th century BC. We also do see the addition of a second smaller denomination – silver litra also showing the eagle standing on a capital. Around 420 BC, a new more artistic design appears on the tetradrachm showing the eagle with spread wings clasping its dead prey – a hare. On the reverse, we still see a crab but now two shells appear along with a fish, most likely a gurnard. In 413 BC, Akragas issued its first and only gold coin – the diobol of 1.35 grams. We also see a much celebrated silver dekadrachm with a spectacular design of Helios driving a quadriga with four prancing horses. This time the reverse design bares the eagle clasping its prey. It has been argued that the cause for the issue of the dekadrachm was the victory of Exainetos of Akragas in the Olympic games of 412 BC. Another tetradrachm also appears at this same time with a quadriga driven by a young charioteer being crowned by Nike. The reverse displays two eagles with a hare. Just when life couldn’t get better for Akragas, fate dealt her an unwelcome death blow. The dark cloud of war was once again on the horizon for the city. TheAthenian defeat in Sicily before the wall of Syracuse (413 BC) opened the door in Sicily once again for Carthage to expand her territory. The Carthaginians entered Sicily under the pretense of supporting Segesta in its struggle with Selinus, which was destroyed in 409 BC. Once in Sicily, the Carthaginians did not leave. In 406 BC, the ancient city of Akragas met her fate – she was sacked and burned. The destruction of Akragas is self-evident within the monetary system of this once great city state. Following the Carthaginian victory, we no longer find new coinage. There was a complete void of any silver mintage and what bronze coinage appeared was only the half-litra (hemilitron) of previous issues counterstruck on old worn planchets. This period of depression appears to have been between 405 and 392 BC. In 287 BC, Phintias (287-279 BC) came to power at Akragas. The silver coinage consisted of a drachm and its half with a few small bronze issues. The silver coinage disappeared shortly before the outbreak of the First Punic War (264-241 BC). During the war, we find only some small bronze coinage being struck. Between 241 and 210 BC, only two small bronze coins were struck during the period of Roman occupation. In 212 BC, the Romans sacked Syracuse and from 210 BC Akragas merged into the Roman Empire.